Pippa slipped out the front door today 8/18/2013 and her mom, Pat, is beside herself. Pippa is a former mill mom and was rescued through our group. She is very fearful of humans still, shy/timid, for which reason DO NOT APPROACH/CALL/CHASE. It will cause her to bolt. 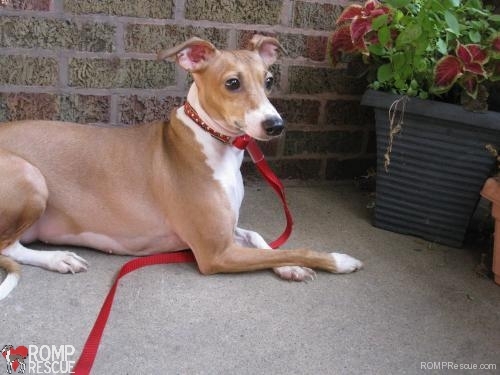 Please, CALL IMMEDIATELY if you spot this lost Italian greyhound Wisconsin. Pat (Pippa’s mom) went out looking one more time and Pippa came out from hiding when she want to the visitors parking lot complex where she lives. Pippa didn’t want to go to Pat but eventually got in the car when she realized her canine sister was in there. PS Kiss your pups and guard your doors when you open them! 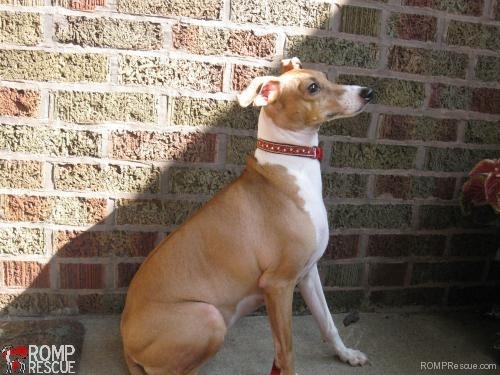 This entry was posted in ALL, Lost dogs and tagged burlington, found italian greyhound, ig, iggy, italian greyhound found, italian greyhound lost, italian greyhound missing, lost dog, lost dogs, lost italian greyhound, LOST ITALIAN GREYHOUND Wisconsin, missing italian greyhound, wisconsin. Bookmark the permalink.